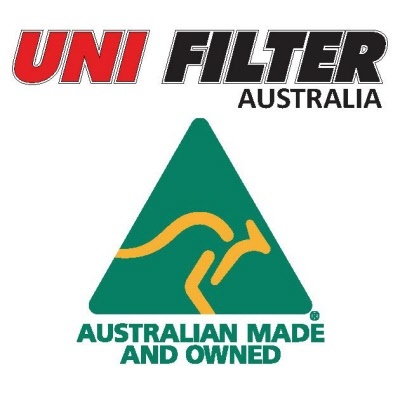 Welcome to our website, we offer one of the world's largest ranges of automotive air filters, proudly manufactured in Australia by a totally Australian owned company. We have in excess of 7000 air filters available for Cars, SUV, 4x4, Motorcycles, ATV's, Trucks, Performance, Universal and Industrial air filters. Our development programs and leading edge CNC manufacturing techniques are second to none. Please check out our range and if you would like any further information please contact us! Unifilter Australia members will receive information on new products, Unifilter news and receive member only discounts and offers! 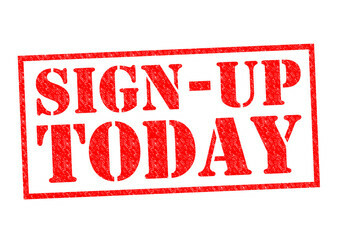 To become a member follow the link at the top of our website. 2018/19 Catalogue available for download now. To download a copy please click on the picture. The 2018/19 catalouge includes Automotive air filters, 4x4 Pre-Cleaners, Pod filters, Motorcycle air filters & our new range of Motorcycle oil filters. Toyota Land Cruiser 76/78/79 & 200 series, Toyota Prado 150 Series, Toyota Hilux GUN 122,123,125 & 126 Series, Nissan Navara D40 & D23, Mitsubishi Triton ML-MQ, Isuzu D-Max TF Series to name just a few. 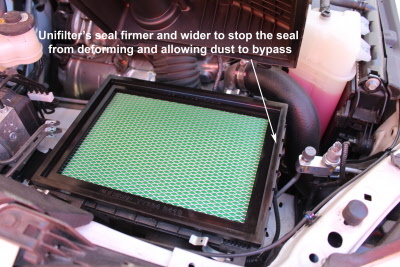 The main reason for the dust issues on all these vehicles is the sealing edge of the filters. Rubber seals on plastic are not the best option when used in dusty conditions. Plastic air boxes warp out of shape when they heat up. Rubber does not warp the same way. As a result the rubber seal does not compensate for the plastic going out of shape. This is the reason all dirt bike filters are foam air filters with foam seals. The foam seal takes up the slack when the box air box warps. To fix the sealing issue on the Toyota Land Cruiser and Prado models we have added a foam seal to the sealing edge of the rubber seal. The sealing edge of these filters is flat so we can add a special foam seal that doesn’t breathe, so dust will not penetrate it. The other style of panel filters use a step style seal. These filters use a small contact point to seal on the air box. This is fine on road going car where dust is not and issue. On a 4x4 the dust will find its way past this point easily as the air box heats up. Due to the style of the seal we cant use foam to help with the sealing of the air box. To help improve the seal on these filters we have widened the sealing edge and made it flat rather than a point to spread the sealing point. 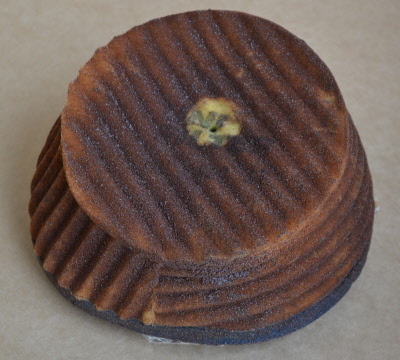 We also make these filters ridged so they cant deform under load like the O/E style filters. Our panel filters use two layers of foam. The outer layer is the work stage and the inner layer is a back up stage. Effectively it’s two filters in one. Foam is also the best filtering material for dusty conditions. When the correct oil is used on foam filters they will continue to breath and filter, even when dirty. 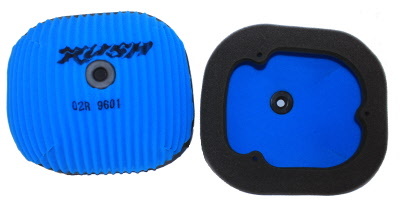 You can also buy spare foam inserts for when you are traveling. This allows you to simply replace the inserts, bag the dirty ones up to clean when you get home. They take up very little room in your vehicle. Oiling and Cleaning foam air filters correctly is very important. Only use foam air filter oil when oiling foam air filters. Oil designed for Cotton air filters is NOT suitable. Only use oil that comes in a plastic bottle and is thick in consistency straight out of the bottle. Never use spray oils or oils that go on like water and then become tacky. These oils will shorten the like of the foam. When cleaning only use Mineral turpentine or Unifilter’s Citrus Cleaner. Petrol, Kero & Metho etc will shorten the life of the foam. Using a sealing grease around the filter sealing edge is also a good idea. We recommend using regular bearing grease. Some rubber sealing greases have chemicals in them that can affect the sealing foam. 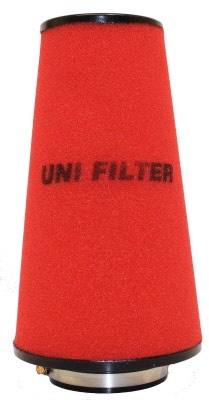 Unifilter also manufactures a large range of snorkel pre-filters. These are a great addition when going off road and especially if travelling in convoy. Pre-cleaner are designed for use when its dusty. They can be used in normal driving conditions with out affecting performance but to get a longer life out of them we only recommended using them when the conditions require there use. Motorcycle product of the month! 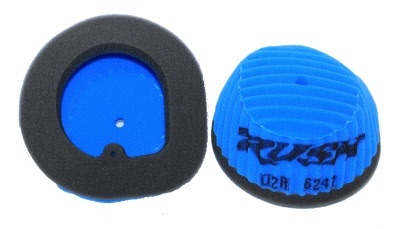 O2Rush Performance Race Filter range. Performance product of the month! Custom Induction Pods are designed for EFi, Turbo & Marine applications. Unifilter makes Straight & Conical foam design is perfect for fitting into tight areas. Filters are supplied pre-oiled ready for use. The optional outer pod cover is recommended when using in dusty conditions. The pod covers are easy to remove and service. Standard foam colour is Red. 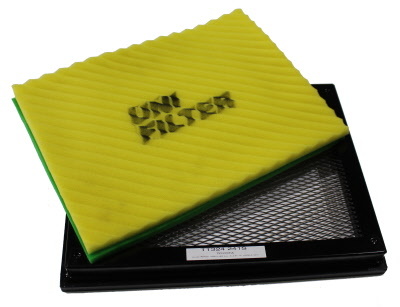 Why Unifilter air filters are the best! If you drive or ride off road you can be sure that Unifilter will protect your engine like no other air filter can! Click Here to view 4WD Action Magazines independent test! 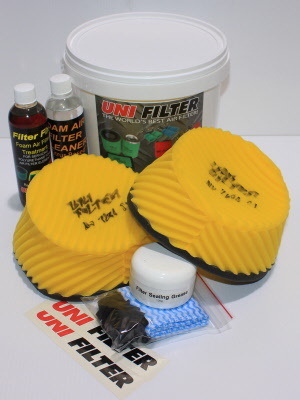 *Unifilter Australia does not recommend using the Air Filter Oil & Cleaner used in this video! Always look for mineral based or semi synthetic filter oil that is thick in consistency when you go to apply it.. Never use filter oils that come packed in a metal containers/spray cans or that go on like water then become tacky! These oils contain chemicals that will shorten the life of your air filter. For cleaning your air filter Unifilter Australia recommends using Mineral Turpentine or Unifilter "Citrus Foam air filter cleaner"
Click here to view the independent test performed by 4x4 Action Magazine and watch this great video below independently produced by one of our Adventure Bike customers after traveling 4,000 km across the desert on his KTM 1190 Adventure! Why choose Unifilter "ProComp2" Dirt Bike Air Filters! The world's best dirt bike filters! Many people ask us why they should use Unifilter "ProComp2" two stage air filters in their dirt bike. This is why! 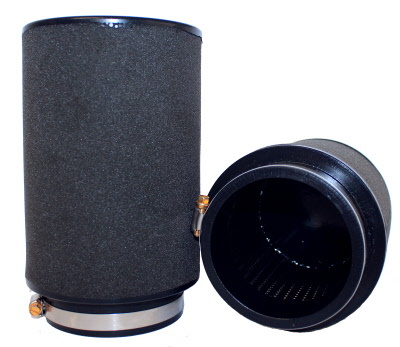 Unifilter "ProComp2" two stage air filters are the only proper 2 stage air filters on the market. ProComp2 air filters are two filters in one. All other brands are bonded twin layer filters made by laminating a fine and coarse layers of foam together. The laminating process reduces air flow so to improve air flow the outer layer is made using a coarse grade of foam. This in turn reduces the filtration quality of the filter. 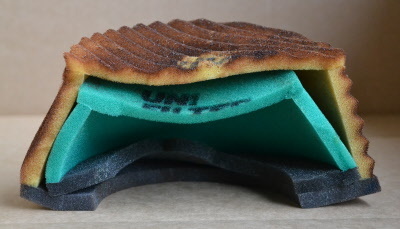 The two layers of foam used to make a ProComp2 dirt bike filter are both fine. This in turn give your bike the best air flow and filtration possible. The two layers can be separated for cleaning. You will not get dust and sand caught between the layers. As you can see from the pictures the outer layer does all the work and the inner layer is a safety stage. 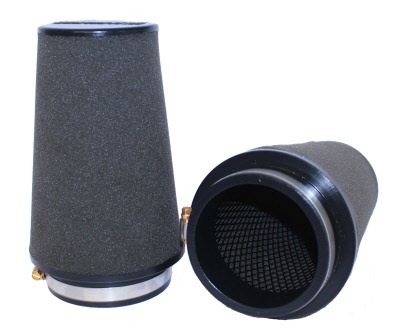 Added to this Unifilter uses 'Ultra Soft" foam seals on the base of the filter. This makes for the perfect seal between the filter cage and air box. 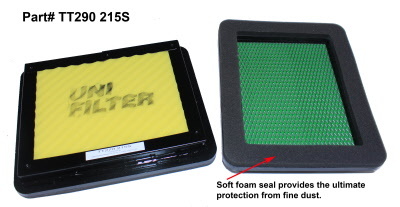 Some air filter brands use a rubber seal on the base of their filters. 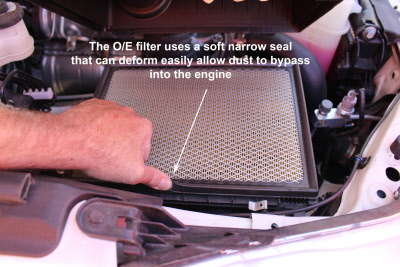 This may work well on a car filter but when dust is involved it can allow for dust to pass if the filter is not seated correctly or the air box plastic warps due to the heat of the engine. Foam seals will compensate for this as they mold better to any imperfection. When selecting your air filter for your dirt bike you should always select a good quality foam air filter oil. You are best to use a Mineral Based foam filter oil. Mineral Based oils will not dry out like synthetic foam filter oils in extreme dusty conditions. Unifilter "Filter Fix" is a mineral based filter oil that we have developed over the last 30 years. We have not found a better oil for use in Australia's harsh conditions. Always avoid using filter oils that come in metal containers and spray cans. These oils can have an adverse effect on the foam and glues used to make air filters. Available separately for $39.95 or in our great value "Combo Packs" $99.00. The Combo Packs include 2 x ProComp2 air filters, 1 x 250ml Unifilter "Filter Fix" filter oil, 1 x 250ml Citrus Filter Cleaner, 1 x 100g tub of sealing grease, 1 x servicing accessories pack, all packed in a handy servicing bucket. This is a saving of 15% is bought separately. 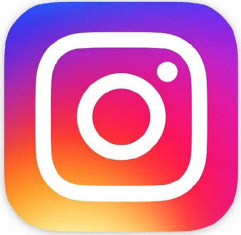 If you have any questions please feel free to contact us via phone, email or through our Facebook page! 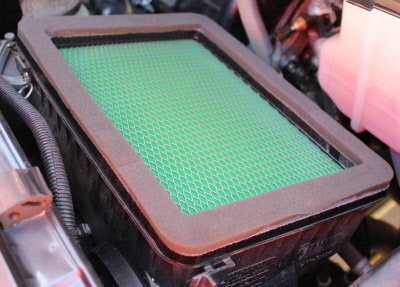 Australian Car Mechanic Magazine recently asked us for some advice on choosing the best performance air filter for you car! Click Here to download the article. Transmoto Magazine dropped by our factory for a tour and a chat about our operations!